Learn how to make a simple and cute piggy bank. Why not wear a poncho instead of a raincoat to keep yourself dry during the monsoon? Watch the video to learn how to make it. It's really easy! Paper boats are fun. 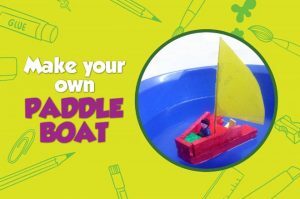 But a rubber-band powered paddle boat is more exciting! Just give the paddle a little twist and watch it zoom across the water.